As you may know by now, Ole Miss is heading to the Big Dance for the first time since 2015. Led by first-year head coach Kermit Davis, recipient of the SEC Coach of the Year honor, and two skilled guards, Terence Davis and Breein Tyree, who combined to average 33.3 points per game in the regular season. Terence Davis drives the ball down the court at the game against Tennessee earlier this season. The Rebels narrowly lost the game with a final score of 71-73. File photo by Katherine Butler. Terence Davis and Tyree have garnered awards for their play this season. Both were named to All-SEC teams, and Tyree made first team All-SEC. Their play has propelled Ole Miss to a No. 8 seed in the South region of the NCAA Tournament, where they’ll face the No. 9-seed Oklahoma Sooners in Columbia, South Carolina, on Friday. This is a team that was picked dead last, No. 14, in the preseason media poll behind the likes of Vanderbilt, who finished winless at 0-18 in conference this year. The Commodores are the first team in 65 years to hit that low in the SEC. In hindsight, that preseason ranking seems ridiculous. But was it at the time? I’d say no, considering the Rebels were bringing in a first-year coach and coming off of a season in which they finished last in the SEC at 12-20 (5-13). However, nobody knew what the incoming head coach from Middle Tennessee was capable of. Why would they? Save a few people in sports media, not many were aware of the powerhouse program that had been built in the last 17 years in Murfreesboro, Tennessee, under his tutelage. Ole Miss returned four of its top six scorers from a year ago — a welcome sign for any first-year coach — but the hand he was dealt appeared to be mediocre on paper, at best. The Rebels’ three top scorers this year were all recruited by former head coach Andy Kennedy, and they were all on the squad during last year’s dismal 20-loss season. The jump in production from them is astounding, and the credit for that should be given to the players for staying in the gym and improving their games and, of course, to Kermit Davis. 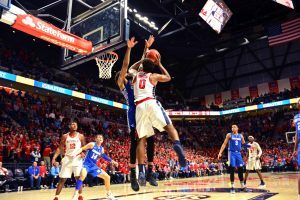 Tyree has made the biggest jump year-to-year of any player and has taken over the top-scoring role, now averaging a solid 18.2 points per game on 47 percent from the field. In comparison, he averaged just 10.8 points on 39 percent shooting a year ago. In addition, his PER, or player efficiency rating, has made a significant leap. Last year, under Kennedy, Tyree had a very decent 13.5 PER, but he has upped that to a 20.4, indicating he’s been performing above average on a consistent basis under Kermit Davis. Ole Miss forward Blake Hinson shoots the ball at the game against Kentucky earlier this season. The Rebels are headed to the NCAA tournament for the first time since 2015. File photo by Reed Jones. Terence Davis, last year’s leading scorer, has taken a step back in terms of being the top dog, but his play has also seen significant improvement. A year ago, he averaged 13.8 on a lackluster 41 percent from the field and 32 percent from 3-point range. He’s now averaging 15.1 on a more efficient shooting percentage, 45 and 37 from the field and the arc, respectively. Devontae Shuler has also made a big leap in production, and he may have the most potential of the three players mentioned. As a freshman, he averaged just 6.0 points, but now, under Kermit Davis, he’s in double digits with 10.2 and has improved his field goal percentage by more than 10. His 16.5 PER has jumped by nearly five points from 11.8 in 2017-18. With all of that offensive success under Kermit Davis, the defense implemented under the new head coach may still be the biggest indicator of team success. 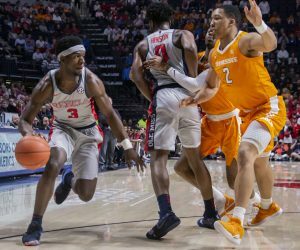 Ole Miss is holding opponents to eight fewer points per game than last year, getting one more steal as a team and forcing two more opponent turnovers per game. On top of that, the Rebels have held opponents to almost 250 fewer total points than in Kennedy’s final year, down to 2252 from 2500. These statistics show that coaching may be more important in college basketball than in any other sport. Kermit Davis has gotten this team, a very similar team to last year’s 12-20 squad, into the NCAA Tournament as a No. 8 seed. This is not to downplay what Kennedy did for the program — he is the all-time wins leader in school history and led the Rebels to multiple NCAA Tournament berths. But this is a new era for Ole Miss. Kennedy brought Ole Miss to national relevance, but Kermit Davis will do the same and take Ole Miss to heights never thought possible. The rest of the SEC is on notice with Kermit Davis on the sidelines in The Pavilion, and it’s going to get scary for the other 13 teams in the years to come.